Lorraine Paton: Alberta: My Mayday Trees are blooming! Today, I'm talking about trees. The selection of plant materials that will actually live and thrive in Alberta is tiny, especially when compared to Ontario, British Columbia, or other more moderate climes. Our climate is tricky - not only can we have temperatures from minus to plus 30 degrees Celsius over the course of the year, but we also have the Chinook winds I mentioned in a previous post. It is actually the Chinooks that pose the biggest challenge for plant materials, because the ground can thaw and then freeze several times over the winter. It takes a special plant to survive that cycle. Even Edmonton, which is further north but doesn't have the Chinook winds like southern Alberta, has more variety in plant materials. Out of all the trees we can successfully grow in southern Alberta, the Mayday Tree (Prunus padus commutata) is my favorite! 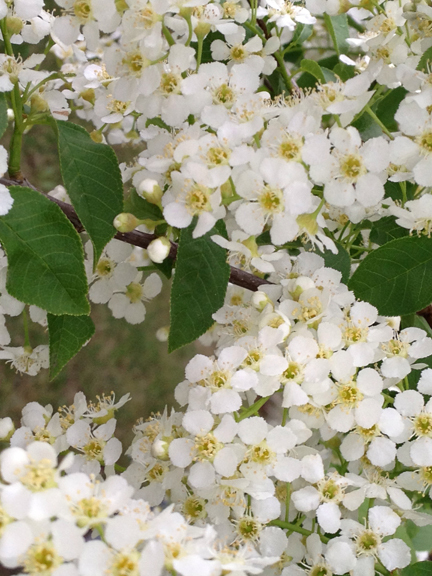 In the spring, the Mayday Tree's leaves are almost the first to appear, and then about a week later the tree erupts with clusters of creamy white flowers. They are the first showy trees of the year, and their flowers smell absolutely wonderful! My yard has two Maydays! And they've just started to flower. I love the scent - I think I could live under their branches for the next week while the flowers are blooming. Do you have a favorite tree or first sign of spring? I LOVE the name of this tree, even though I've never heard of it before. I have a special fondness for May and May Day, so the minute I heard it I was in love. And then I saw those beautiful white flowers and was smitten. I can just imagine the fragrance! I've been telling my husband for the last two days that "it smells like June" whenever we're outside. We've finally lucked into some very warm weather and the air is fragrant with a combination of honeysuckle, grass and blooming trees/flowers. I always associate that the smell with June. It says summer has arrived. I used to have a flowering tree in my yard but we cut it down to make room for a pool (which, I admit, I love, LOL), but I miss that tree and it's beautiful blooms. Thanks for sharing yours! The Mayday Tree is a type of cherry tree that doesn't grow everywhere. I really missed it when I lived in Ontario. I love the smell of late spring / early summer too! It is just so refreshing! It makes me happy! So nice to have a pool. We don't have one, but once in a while I dream about having a hot tub. :) Lucky you! Hi Cindy! I'm glad I could help! :) It smells divine, doesn't it? Hi Stacey, I am not an arborist, but I think your tree might just be taking a year to adjust to its new environment. There are a lot of trees and shrubs that don't flower or fruit the year after a move. BTW - A pool sounds great! I wish I had room in my yard for one!